Since summertime is vacation period especially for kids most of the school year is already ended by this time. Here we are, Mommies and Daddy, asking our kids what summer class they want to attend to gain some skills or to enhance the skills that they have. My #HarveyAndreiAdventurer is still a kid but I'm looking forward to these activities for him, that is why I joined the press launch of i-Shine Talent Camp 6 from Promil. Promil formulate this event to help nurture our child’s gift, PROMIL® Four i-Shine® Talent Camp 6, a venue for children to play and learn, continuously commits into helping the next generation of talents and allow them to discover and develop skills set focused in the field of Art, Engineering, Dance, and Music. The event was hosted by Toni Gonzaga, which is now a mother of a cutie boy Severiano. The program started with a question and answer portion from the panelist which they share all of the knowledge they know wholeheartedly. I will share with you some of the questions. How can you know what talent does your kid have? - The early years of the children, they tend to show clues to their parent on what talent they adhere. Some children are inclined to music making a rhythm while tapping their hands against their chair. Parents just need to observe their children know what talents they do excel. Speaking of proper nutrition milk should be an integral part of a diet. 3 y/o shall have to have a dietary source of important nutrients to unleash their talents. What is the difference of Promil 4 to other milk at the market? Promil is difference has a NUTRISSENTIALS® a unique combination of essentials and important nutrients, Promil is formulated milk. all important nutrients and ingredients are formulated based on recommended levels. The next part of the program is where the kids who are drinking Promil showcase their talents. The previous batch of i-Shine talent camp namely Yessha dela Calzada and Claire Geozon serenaded us with their beautiful voice, while Seth Salada plays the drums and the king of the dance floor that after was Sean Bermudez. Now let me present to you the Camp Masters that will teach your children and share their talents with them. First is the newest add-on to the Talent Camp, Teacher Lei Sta. Maria of Engineering for Kids. She will be focusing on the Engineering part of the Camp where children can learn how to build their own robot and learn some basic engineering stuff. The next camp master is the one who specialized in arts. Kids who excel on drawing, painting and crafts will learn from one of the pillars of Arts and Crafts in the Philippines with Kuya Robert Alejandro together with his Papemelroti Team. If your kid loves to dance this will be the perfect camp that he/she shall join. The Dance camp with non-other than Celebrity Dance Master Teacher Georcelle Sy with her G-Force dance group. Lastly for the kids who love singing, learn from the Maestro himself as Maestro Ryan Cayabyab teach the Music Workshop through his very own music school, The Music School of Ryan Cayabyab. I heard that he wrote two songs just for this Talent Camp. Presenting to you the 4 Camp Masters that will surely nurture your child's talent this i-Shine Talent Camp 6! Children during the press launch got to experience the some parts of the Talent Camp by the Camp Masters. Let me show you around to help you decide which Talent Camp will you bring your kid. Here is the Art Camp, children build a flying owl together with Kuya Robert Alejandro. Where kids need to tap the banana and the other side of the wire to be able to manipulate the ball at the laptop. #HarveyAndreiAdventurer also tried this robot made by children. Please see video down below on how to operate this one. By the way, your kid can build this robot to by themselves if they join the engineering camp! Maestro Ryan Cayabyab, teach the children how to count the numbers with the use of singing. The G-force team divided the group into 4 and begin to teach children the latest dance move that they can offer. Each of the children enjoys dancing with the dance battle also. 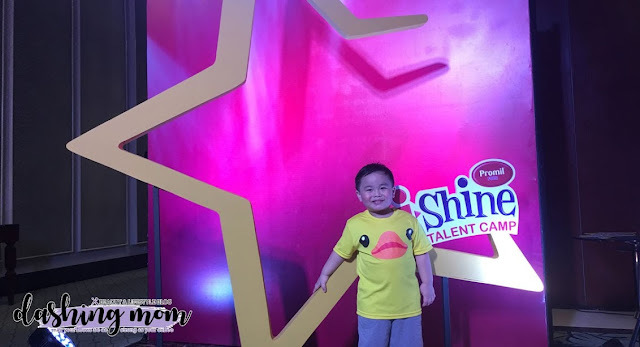 Are you now excited to enroll your kids in i-Shine Talent Camp 6 this year? Want to know how to read along with the details below. Open to kids above 3 - 11 years old only. Visit www.ishine.ph to check the four(4) different talent camp, schedules, and workshops that they offer. Remember parents that you should know what's your child's potential talents are to pick the right workshop for him. Upload photo of the receipt as proof of purchase Validity of receipts must be February 24 to April 17, 2018, ONLY. I am glad to seek out so many useful info right here within the submit, we need develop extra strategies on this regard, thank you for sharing.